Many teams have embraced the experiment mindset, which teaches that you can learn more from simply trying out an idea and seeing the results than you would ever learn from intense upfront analysis. While this mindset can help your team make rapid gains, there’s also a dark side to this approach. Although experimentation can yield faster and more in-depth learning than traditional analysis, many teams forget that some initial lightweight analysis can also be useful for helping them choose those experiments that are the most likely to succeed. As a result, these teams embark upon poorly planned and risky experiments without first considering what they stand to gain…or lose. The root of the problem lies in the word “experiment”. By their nature, experiments can be very open ended. This can make them a bad model for change since the lack of a defined end state can lead to a lack of clarity on how to proceed, or even a lack of understanding of what the team stands to gain from the experiment. A better model is a bet. Imagine playing a game of poker but with no chips. Without a need to commit chips then each hand becomes nothing more than a simple experiment with no potential upside or downside. This means that you could play forever and still have no real investment in the game. But adding chips to the hand changes the game. When you’re working with a finite amount of chips you start to become very aware of the real possibility of gain and the real possibility of loss that hides in each hand. This forces you to weigh your options much more carefully. Watch a great poker player play the game and you may be surprised at what you see. Great poker players don’t play every hand…in fact, many even sit out more hands than they actually play. Why? Because great poker players know that they have a finite amount of chips and, if they want to play the game long enough for that big pay out, then they need to protect the chips they have. This means that they evaluate each hand at the outset and decide if it’s a hand they stand a chance at winning. If they’re not likely to win, then they simply bow out and wait for a better opportunity. This is because they know that every hand has a cost, and the more bad hands that they pass on, the more likely they’ll still be in the game when those truly great hands come along. So should you abandon experiments altogether? Not so fast. A true embracement of an experiment mindset is one of the hallmarks that separates the best teams from the mediocre ones. The difference, is that rather than simply diving headfirst into every opportunity, the best teams evaluate each of the possible experiments on their plates and choose to focus on those experiments that have the most potential for a positive upside, given the investment they’ll need to make. For example, imagine that during the most recent retrospective your team complained that their Product Owner is not easily accessible throughout the sprint to provide feedback or clarification on items that are in progress. As a result, your team has repeatedly found themselves reviewing items at the Sprint Review that turned out to not be what the Product Owner had in mind. This means that they’ve had to invest additional time in the next sprint to rework those items, which has slowed the team down as a whole. After a few minutes of brainstorming your team comes up with several experiments they could run which could help address the problem. For example, maybe the Product Owner could appoint a proxy Product Owner on the team that would be empowered to provide feedback and make decisions on the Product Owner’s behalf whenever he’s unavailable. Or, perhaps the Product Owner could make more of an effort to attend the team’s standup whenever possible so he’s available to provide feedback to the team as items are complete. Of, maybe he could even keep regular “office hours” in the team room so he’s more accessible to the team a few days per week. Any of these options could be worth pursuing, and when each is considered as an experiment they all look equally promising. It’s only when we look at these options through the lens of making a bet do the tradeoffs between each become more clear. The table below demonstrates a simple framework for evaluating different experiments through the lens of a bet. When a team starts to look at experiments through the lens of a bet, not only does the potential for gain become clearer, but they also better understand the investment that they’ll need to make to carry out each experiment. This can help them better separate those experiments that are likely to fail from those that have a better chance of success so they’ll know where to focus their efforts. An experiment mindset can be a powerful tool for teams who desire to improve their way of working. But, while experiments may appear to be free, few truly are. Most experiments carry with them very real costs, but by evaluating the potential for loss or gain of each your team can focus on those experiments with the greatest likelihood for success…meaning that they’ll be around to play the game for a long time to come. While the tagline Zappos abolishes Managers has gotten great press, in actuality it’s a bit of an over-simplification of what’s happening. 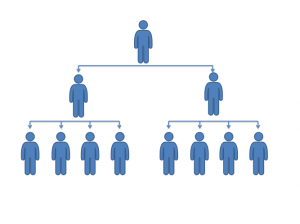 There's been a lot of discussion lately about Zappos' move to eliminate managers from their hierarchy. If you haven't heard yet, go check out the Fast Company article on the transition, which does a nice job of summing up the move. While the tagline Zappos abolishes Managers has gotten great press, in actuality it's a bit of an over-simplification of what's happening. In actuality, Zappos is transitioning to a new structure which organizes its employees in groups around work to be done, called a holacracy. Rather than following a traditional hierarchical management system, this new structure tends to resemble self-organizing circles focused on individual projects comprised of employees selected for their skill sets. Are there really no managers? Perhaps, but that doesn't necessarily equate to no leaders. Reams of business literature have told us time and time again that given any group of sufficient size, leaders naturally emerge. Whether we want them or not, this seems to be a a natural part of human nature…it's in our DNA. If this is indeed the case, then any attempt to eliminate traditional managers from an organization may be for naught. Left unchecked, it wouldn't be surprising for the exact same organizational structure to reemerge, sans titles of course. However, this natural tendency to evolve towards structure may not be a bad thing either. Elimination of titles and structure will effectively give Zappos the opportunity to press the reset button on their organization and allow the true leaders to emerge across the company. Most organizations would kill for this chance. 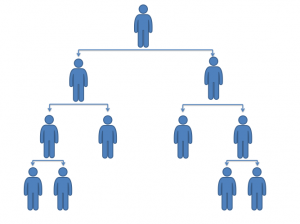 What's wrong with a traditional hierarchy? Of course, this begs the question “What's wrong with a traditional hierarchy?” After all, history is full of companies which have become very successful under one. However, the fact that traditional management hierarchies have not killed every company in history doesn't exactly absolve them of guilt, either. Imagine a small startup, perhaps made up of two co-founders. It's unlikely that one co-founder has asserted themselves as the manager of the other. Rather, its more likely that the two co-founders view one another on equal footing and have come together due to the unique skills each has to offer. In the early stages, even as a few more employees are added here and there, it's likely that this culture will remain largely unchanged. However, as the company becomes successful and begins to scale this organizational structure will not. Eventually the leadership of the company will face a day when they need to introduce some sort of management structure to help the company scale. On the whole they will be faced with two options: Flat or Deep. 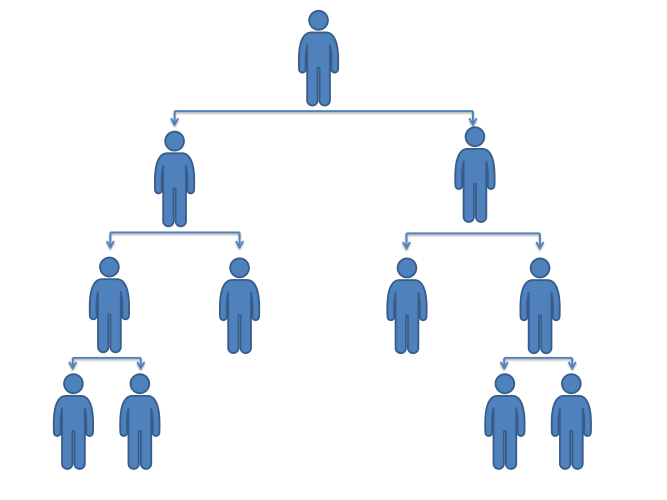 Flat hierarchies tend to evolve when individual managers have responsibilities for managing large groups of people. Fewer layers of indirection between the people on the bottom of the organization and those on the top. This tends to lead to more efficient execution of strategies set by the top ranks as the strategy is less likely to be watered down or changed as it passes through each successive rank. The evolution of cross-functional teams. Since less managers are available in the organization, they tend to accrete more direct reports. One of the common side effects of this is those reports may not only specialize in the same field as the manager, but also those that are complementary. For example, an engineering manager may not only be responsible for managing engineers, but may also be given responsibility for complementary teams such as quality assurance or technical writers. These cross-functional teams tend to delivery more efficiently as the walls of bureaucracy are torn down. In fact, this can even result in reduced in-fighting amongst groups that have to work closely together. Faster scaling teams. When an individual manager is already responsible for managing 12 people, adding one new employee to their ranks has much less impact than adding an employee to a manager who only has 3 direct reports. This lets flatter organizations scale up teams more rapidly, for better or worse. However, for all of the benefits of a flat organization they're not without their drawbacks. Less one-on-one attention from managers. Obviously a manager whose responsible for 12 people has less time to spend with each than a manager whose only responsible for 3. This translates to not only less time for one-on-ones, goal setting sessions, and mentoring, but also less time to simply get to know each employee on a personal level. This can lead to less engagement amongst employees, less attachment to an organization's goals, and ultimately, higher turnover. Less mentoring to those employees not in the manager's speciality. Let's return to our example of the fateful engineering manager tasked with responsibility for not only software engineers, but also quality assurance engineers, and technical writers. If the manager's background is in software engineering then they are likely to be an excellent resource for their reports who are also aspiring software engineers wanting to take their careers to the next level. However, what about the quality assurance engineers and technical writers? If this is not the manager's area of speciality they'll need to invest extra time in learning how to coach these employees, or risk having an overall lower skilled team. Deeper hierarchies tend to evolve when organizations grow towards many layers of middle management, with each manager responsible for only a few direct reports. More one-on-one attention from managers. More managers means smaller teams which means that managers have more time to focus on each of their people. This can translate into not only more frequent one-on-ones with each employee, but also more time for career planning and goal setting. All of this translates into each manager getting to know each employee better and having more opportunities to imbue the organization's culture and goals to the employee. All of this can lead to more engagement for the employees and, ultimately, lower turnover. More appropriate mentoring for each employee. More managers also means that it's less likely teams will evolve to be cross-functional. Rather, they'll tend to stay siloed in teams focusing on specific areas of expertise. The benefits of cross-functional teams notwithstanding, increasing the likelihood that a quality assurance engineer will be mentored by a manager who built their career in quality assurance means that engineer can have more relevant mentoring and may reach their career goals quicker. These benefits aside, however, deep hierarchies are not without their drawbacks. Less efficient execution of strategies. Just like the classic game of Telephone, no matter how great any strategy starts at the top, the more layers of indirection it crosses through the more likely it is to become weakened or watered down. In the worst scenarios, it may even be corrupted to serve each individual manager's own goals and agenda. More silos between closely operating teams. If you have more managers the temptation is greater to divide teams amongst specialities. While this can lead to better management of each employee, the effect of these artificial barriers between teams working together each day cannot be understated. Given any team structure the members of those teams will eventually grow to rival and compete against one another. While a little competition is a great thing, it can easily get out of hand and evolve to resentment between teams working closely together. Once started, this in-fighting can be difficult to reign in. Slower scaling teams. 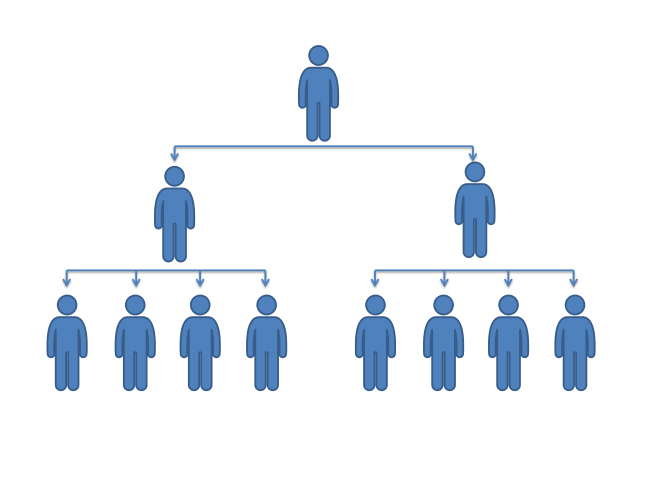 When a multitude of hierarchies exist in a given organization adding more employees can create friction. This is due not only to the greater impact a new employee can have a smaller team, but also to the waves of indirect disruption the change can have on teams that work directly with that team. While this effect may occur simply because the manager is more effectively managing their people due to the smaller team, the effects that it can have on an organization that needs to scale up and down quickly shouldn't be ignored. Will this scale better than a hierarchy? Returning to our discussion of a holacracy, one of the biggest questions facing the this structure is how effectively will it scale? Bearing in mind the points above regarding deep versus flat hierarchies, we know that larger teams, in particular cross-functional teams, tend to scale quicker than smaller and more siloed teams. The holacracy seems to exhibit both of these larger and cross-functional qualities. In addition, we also know that the elimination of a middle management layer could lead to a more effective execution of strategies since each team member has the opportunity to work closer to the top-level decision makers. Whether or not this will be the actual result, however, remains to be seen. While the lack of middle management may in theory give rank-and-file employees more access to top leaders, it also puts the onus on the employee to take the initiative for their own career growth in the organization. This includes not only mentoring and growth opportunities, but also the adoption and incubation of the organizational culture and values across all employees. Given what we know about Zappos hiring practices and resulting culture this may not be much of an issue for the average Zappos employee. However, not every company has earned the reputation of hiring for passion that Zappos has, how this will effect other, less passionate, organizations remains be seen. Regardless of the result of Zappos move to a holacracy I have no doubt that we'll have plenty of visibility and insight in the results, due to Tony Hsieh's transparent operating style. I'm looking forward to seeing what we can learn.